The Victim-Witness Program was established in the Thirteenth Judicial Circuit in 1978. Since that time it has grown to a staff of ten. A victim advocate is assigned to each assistant solicitor and works closely with him/her to ensure victims are afforded all rights to which they are entitled. The program is set up in accordance with Guidelines written by the Victim Assistance Policy Committee. This committee established the operating standards for Solicitor-based Victim-Witness Assistance Programs to implement the Victim’s Bill of Rights which was passed by the Legislature in 1978. The Victim Rights Constitutional Amendment and Implementing Legislation was passed by the South Carolina General Assembly in 1997 and 1998. We are required by law to attempt to notify victims, should they wish to be, of all proceedings in a case. When a crime occurs, the "people of the State" represented by the Solicitor or one of his assistants, prosecute the case. The Victim-Witness Advocate aids crime victims by offering many services that are confidential and free of charge. Advocates inform victims of their rights. They act as liaison between the victim and other agencies. They attend court hearings with victims or attend on their behalf. They inform victims of hearing dates, case updates, and dispositions. They arrange pretrial conferences upon a Solicitor’s request and attend them. They attend hearings when requested by the victim or their family. School groups of 25 or less may come and observe the court process. Students are briefed on court procedures. The students will observe actual court cases - either a trial or guilty pleas. Seating is limited so advance notice is required. Since 1995, the Thirteenth Circuit Solicitor has sponsored an anti- drug poster contest for all middle schools in Greenville and Pickens counties. Through the years thousands of Greenville county students have submitted posters which reinforce the message the drugs are bad for them and their friends. The winners are selected by an independent group of judges and the winners are awarded cash prizes for their art work. The winner of the contest receives $300 cash, grade winners receive $200 cash, and all other finalists were given $100 cash. After an awards ceremony the winning posters are displayed in the Greenville County Courthouse through the month of November. 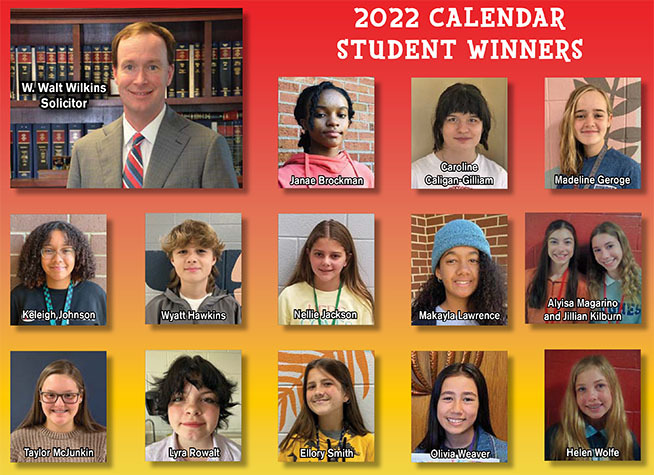 A calendar is then printed and distributed before Christmas to middle school students, teachers and staff at every middle school in Greenville and Pickens counties. The entire project is funded with money made from the sale of forfeited items taken from individuals arrested for drug offences. Click here for the 2019 contest winners announcement. Click here for the PDF version of our 2019 calendar.